Kalajoki Golf’s 18-hole par 73 golf course is located near the shoreline on the west coast of Finland in the popular and beautiful tourist destination of Kalajoki Hiekkasärkät. The green and sandy course is surrounded by a pinewood forest with occasional glimpses of the sea. The course is suitable for beginners as well as more accomplished golfers and the golfing experience changes significantly and provides more challenge when changing the tee from red to blue or yellow to white. 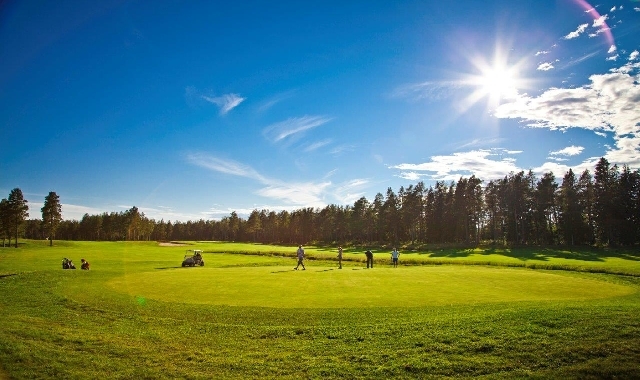 The golf park has also an extensive training area with a driving range and putting and pitching greens and in addition to the 18-hole course, Kalajoki Golf has a 9-hole “Pay and Play” course for the beginners or people wanting to try out golf for the first time. The services of a head pro are available for those in need of further advisement on their technique. The inviting clubhouse in the middle of the park offers various services from a pro shop to a restaurant and a summer terrace with an excellent view overlooking the course and the sea. Next to the clubhouse are changing rooms with fresh towels, showers and a sauna, all free to use for our customers. The pleasant and friendly atmosphere and staff of Kalajoki Golf guarantee you a great visit to the course! Nice and tricky a lot of doglegs but easy to find the ball when you didn't hit the fairway ???? greens and fairway in good shape. Husbilsparkering saknas. För övrigt mycket bra.